My husband and brother-in-law (BIL) both have the amazing ability to treat me like a princess while concurrently challenging me to expand my horizons. They also know that while I am likely to insist that I just want to watch first if my husband shows any intention of getting me to try something like using a circular saw or driving a tractor, I am far less likely to stubbornly wimp out in front of my BIL! 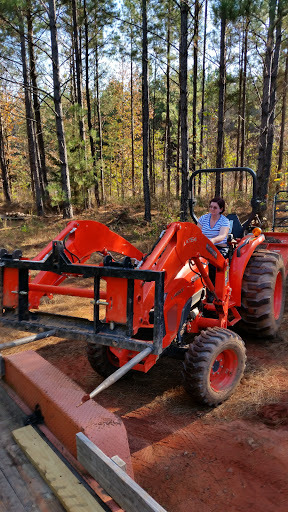 I don’t know if they had this in mind when my BIL told me which side of the tractor to climb up on and then calmly proceeded to instruct me on how to start it, move it, and use the implements. Once I had the basics, I was tasked with picking up a wood post with hay forks. After what seemed like a 500-point turn, I had the tractor perpendicular to the post and BIL kept motioning me forward, and forward, and forward…… Now, on one level I knew that he could move out of the way if the tines came too close, but my English 4 students have been watching A Knight’s Tale, so I could not help but envision the impaling of BIL by my mechanized jousting horse in a A-Knight’s-Tale-meets-Christine video clip that insisted on running through my head. He patiently and fearlessly stood there and then celebrated my small success with me once the post was on its way to wherever I took it next. Patience: I think I value and admire it so much because I have so little of it myself. I do have a hidden well-spring of it that opens up when I am tutoring a student, but most of the time my husband has to endure lots of huffing and eye-rolling when he’s being detail oriented and I’m just wanting to jump in and figure out the details as we go! Back to the tractor. I drove it uphill and in reverse out of the woods the next day, which was a little scary because it tilts a whole lot more than feels safe. If it were a motorcycle, it would have keeled over, and I know what that feels like! I will come to trust it in time, but for now rough terrain makes me very nervous. I spent a good bit of time on level ground breaking up piles of tree branches that had been decomposing for years and then picking up some of the trash (tires, mattresses) that had been dumped in the clearing. I earned some undeserved praise for fortuitously spearing a Cola can that I couldn’t even see with a tine on one of my many attempts to spear a tire that had been irritating me for months. I was so happy to get that tire out of there and gained confidence in use of the tractor controls when I subsequently had to shake the thing off onto our trash pile. Tractor controls still baffle me to an extent, as do many other mechanical things. My inability to remember whether the clutch or the brake is on the left on a motorcycle is the reason I no longer drive my motorcycle and the reason I know what it’s like to fall off one! When my husband or my BIL motion for me to raise the bucket, I look like I’m crossing myself as I try to remember which direction does what and then I still get it wrong most of the time. I keep reminding myself that it took a while for shifting gears in a manual transmission car to feel natural and to not let my lack of patience with my progress defeat me. 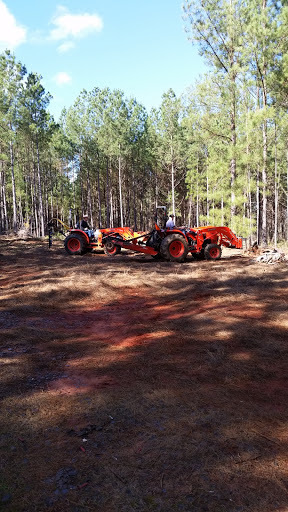 As a tilting tractor still makes me nervous, the men took care of bush-hogging the deck and the front of the property. It’s simply amazing what a difference that makes. The deck is larger than we thought and we will have more than enough room there for gardens, orchards, and greenhouses. The erosion ditch running outside the tree line at the front of the property is not as bad as we thought it was. The culvert up by the road is in good shape. The tractor work this weekend answered so many of our questions about the land. The gate we built makes it less likely that anyone will add more trash. There’s one more trash pile to clean up, and then we’ll be mattress and tire free. The spooky blue bag that I suspect belonged to Bluebeard will soon be gone and my imagination will no longer have to wonder just what is in there! We are making progress. And maybe, just maybe, parallel parking my car will not seem so hard now that I’ve driven a tractor. Next Post Lady bird, lady bird, fly away home.